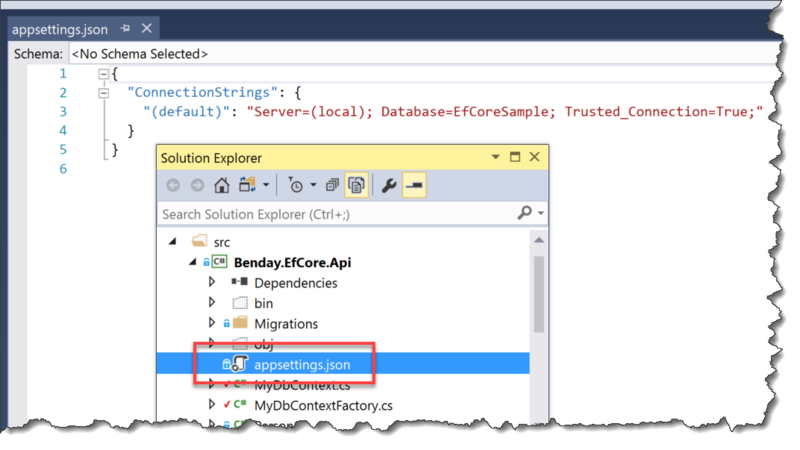 EF Core Migrations without Hard-coding a Connection String using IDbContextFactory – Benjamin Day Consulting, Inc.
Don’t hard-code your DbContext connection strings! The problem is that if you get rid of the OnConfiguring() method, you’ll get an error when you try to run your EF Core database migration. Try it. Remove that method, and run “dotnet ef database update”. Boom! No parameterless constructor was found on ‘MyDbContext’. Either add a parameterless constructor to ‘MyDbContext’ or add an implementation of ‘IDbContextFactory<MyDbContext>’ in the same assembly as ‘MyDbContext’. Ok. Well, you can’t remove the constructor and still have this work with ASP.NET Core. So what’s this IDbContextFactory thing? IDbContextFactory<T> allows you to put the logic of creating instances of your DbContext into a type-safe class that follows a pattern that is known and usable by your code and the tooling of “dotnet ef”, Visual Studio, and Visual Studio Code. It gives you a nice, clean way to separate the persistence details of your DbContext from the construction and configuration details for your DbContext. This pattern fits nicely with the SOLID principles and Separation of Concerns and keeps your code organized. In my implementation of IDbContextFactory<T>, I wanted to be able to read my connection strings from appsettings.json and from environment variables. This would mirror the same kind of configuration and initialization that happens in ASP.NET Core’s Startup.cs. To implement this in my Benday.EfCore.Api project, I added a class called MyDbContextFactory that implemented IDbContextFactory<MyDbContext> and then I added an appsettings.json to the project and moved the connection string out of MyDbContext and into appsettings.json. Move the database connection string to appsettings.json. I ran into issues with “dotnet ef” not being able to find the appsettings.json file. It turns out that when you run your dotnet ef commands against this project from the command line, it sets the working directory to be the ./bin/debug/netappcore1. * directory and attempts to find the appsettings.json in that directory. Ok. Not a problem. I’ll just mark appsettings.json so that it gets copied to the OutputDir. I recompiled and re-ran my dotnet ef database migration update commands and it worked. 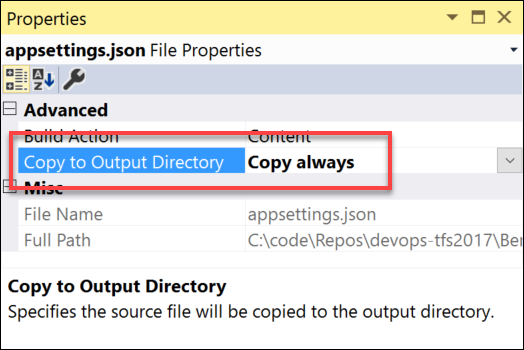 The “Copy always” on the appsettings.json in the Benday.EfCore.Api project was causing that appsettings.json to get copied into the run directory for the unit tests. That was ok for right now but this was going to cause problems because my Benday.EfCore.Tests project would forever be fighting the Benday.EfCore.Api project for configuration supremacy. Not good. Clearly the “Copy always” on the API project couldn’t stay. I needed to have separate configs for the API, Web, and Test projects. I ended up with two public methods on my IDbContextFactory implementation. Create() would let me easily create instances of MyDbContext by reading from appsettings.json files in the same directory as the DLLs. This is helpful for unit tests. 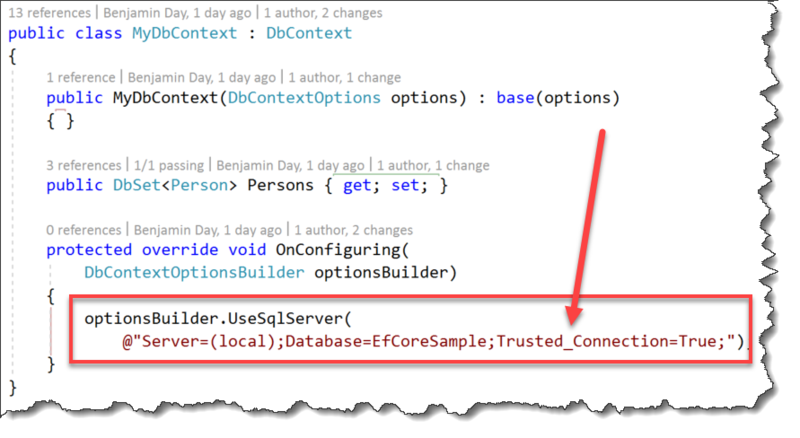 Create(DbContextFactoryOptions options) is the method that gets called by the “dotnet ef database update” command when you deploy your migrations. It assumes that your appsettings.json file will be near the code and the csproj file. The important thing here is that this allows me to AVOID marking appsettings.json as Copy Always in the Benday.EfCore.Api project. This is the key item that keeps this API project from messing up the runtime appsettings.json in all the other projects. The two private methods understand 1) how to create instances of ConfigurationBuilder() with the correct references to appsettings.json and environment variables and 2) how to grab a connection string and create an instance of your DbContext class. Adding a class to your project that implements IDbContextFactory<T> helps you to handle the initialization details of your DbContext class but be sure to keep in mind that it will be called from various environments. — Need help wrapping your head around ASP.NET Core and EF Core? 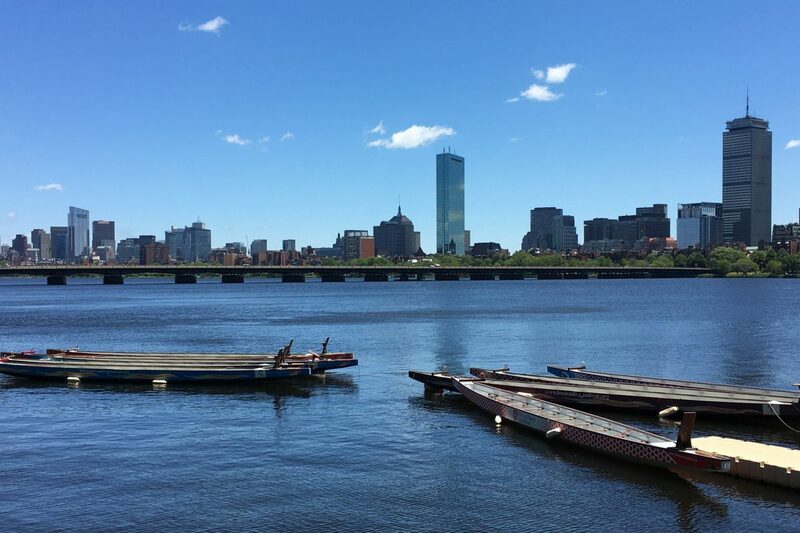 Scrum process problems got you down? Not sure what this “DevOps” thing is? We can help. Drop us a line at info@benday.com. 7 Responses to "EF Core Migrations without Hard-coding a Connection String using IDbContextFactory"
I wonder if you have an updated version of it since the launch of Net Core 2.1 where IDbContextFactory is marked as obsolete with suggestions to use IDesignTimeDbContextFactory instead. I wrote a sample app that I haven’t published yet on my blog that has an implementation of IDesignTimeDbContexetFactory in it. Lemme know if this is what you’re looking for. Thanks a lot for the quick reply. I’ll have a look in detail and see what you’ve got there. Ok, I see… it may be my confusion around the way a DbContext is used and the “Design” side of things. So, I put the IConfiguration in the ctor of that class. But as I mentioned, I don’t know how the CreateDbContext(string args) and the purpose of args there as I would need to understand it better how it works when it is called from the Update-Database, etc. What I was really after is the understanding around the DbContext, and I’m sorry if this is all too basic questions. I am not too sure if a Factory would apply for that context as I can see in your example that it gets resolved by the DI Container when you use the Repository. Is that right?